I love hearing from my readers and exchanging messages with them, but unfortunately I’ve reached the point where I am receiving way too many emails, and messages on Facebook & Instagram for me to respond to! I also have two little kids and a part-time “real job” at an office that keeps me extra busy. I am so sorry, because I wish I could respond to everyone! If you really need to reach me email (or my contact form) is still the best way. Just know it may take me awhile to get back to you. However- many emails and messages I receive are asking the same questions over and over- so I decided to make a Frequently Asked Questions page! I hope this helps!! Do you do coaching? Can I work with you? At this time I do not do any fertility coaching. I am strictly a blogger. Although I know many fertility coaches, I only have one fertility coach that I have worked with- I have both participated in her programs and collaborated with her professionally. 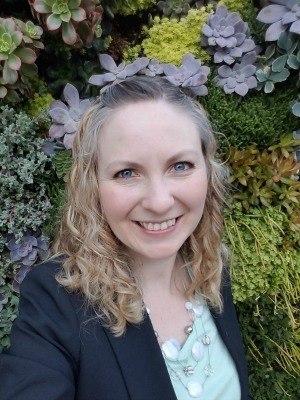 Her name is Sarah Clark of FabFertile and she does couples coaching that includes functional testing to determine optimal diet and supplements. Here is my affiliate link to her couples coaching program! (Read here for an explanation of my affiliate links). She also will do a sixty minute fertility or nutrition consultation if you aren’t ready for a full program. I am also a big fan of the Natural Fertility Prescription Program. It also is a full program that includes extensive testing and tailored advice coupled with 1:1: coaching. It is run by a Naturopath doctor out of Switzerland named Iva Keene. If you are interested, you can grab her free report on Restoring Fertility Naturally to see if her style meshes with yours! I am currently interviewing multiple other Fertility Coaches to try to come up with a list of options for my readers! How can I support your blog? Can I donate to you? Is your diet right for me? Maybe, and maybe not. 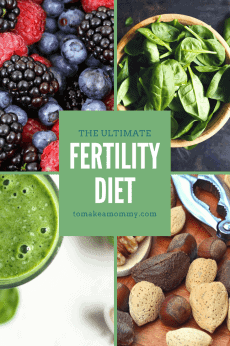 Although it is a pretty darn solid, evidence-based fertility diet, I am a firm believer that one of the of the most important parts of each couples’ fertility journey is figuring out the diet that is the best for each person to achieve optimal health. Maybe you need a ketogenic diet to be super healthy and make great eggs or sperm. Maybe a ketogenic diet will make you gain weight and make your blood pressure soar. Maybe you thrive on a plant-based diet with lots of nuts and beans. Maybe nuts and beans make you bloated and you need to do an Auto-Immune Protocol Diet to rule out any other inflammatory foods. Or maybe you need to do more Paleo and eliminate all grains. I don’t know. I’m not you, I’m not a nutritionist, and I don’t know how your body feels or reacts after you eat things. I do know that the diet I did is based on strong fertility science. 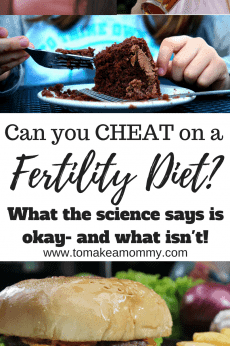 The science is clear that things like alcohol, caffeine, and sugar are terrible for fertility, and that eating a lot of organic leafy greens is good for fertility. After that, you’re going to have to do your own research! You can check out my free e-book on tailoring the Fertility Diet to your needs to get started! The long and short of it is, if you have multiple health issues your best bet may be to do a serious elimination diet with slow reintroductions like the Auto-Immune Protocol or Whole30, and/or work with someone who can do functional and nutritional testing to determine food sensitives (Sarah Clark does this in her program or you can just book a nutritional consultation with her). I LOVE your diet and the science behind it. But I’m overwhelmed trying to figure out recipes and meal plans. Do you have a recipe/meal plan book I can buy? Errrr, no. I’m sorry. I’ve been promising my readers this for almost a year and I still haven’t done it. It is very much on my to-do list!!!! For now- here is my sample one day diet! Be sure to sign up for my newsletter and get my list of 79 Things so you know when I do write the book! Okay, so you don’t have a recipe/meal plan book? Do you recommend any fertility cookbooks out there? I am currently in the process of reviewing every fertility cookbook known to man or woman and am hoping to soon have a post up with my thoughts on all of them. So far, I haven’t found a single one that matches my diet or makes me completely happy. I will have to write one myself! In the meantime I like the Fabulously Fertile Cookbook. Although it has a few things I avoided like soy and natural sweeteners (like maple syrup), and it is a little heavy on the fruits and high-carb veggies, overall its a great book with good recipes and a decent meal plan. I promise I’m working on one myself that adheres to all the latest research and what I did!! How can I boost egg health? 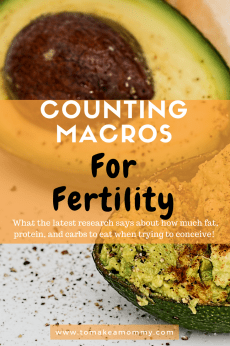 Well, basically everything I write about on the blog is about boosting egg health, with the exception of a few posts that are about male fertility or boosting implantation. 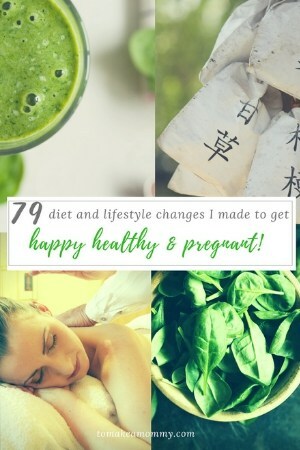 So, check out my 79 Things I did to Get Happy, Healthy, and Pregnant, and read ALL my blog posts. (Haha. I doubt anyone has read all my blog posts, not even my mother!) And, you should read the absolute best book on egg health, It All Starts with the Egg, which completely changed my life and helped guide my fertility journey. This is my particular health situation, can you advise me? Unfortunately, I can’t advise you. I’m not a doctor, naturopath, acupuncturist, or any other kind of health provider. Heck, I’m not even a health coach. I did a ton of research for MY diagnoses- endometriosis, High FSH, low AMH, low egg quality, MTHFR mutation, and multiple early losses. I am in the process of blogging about everything I did to overcome all of those. But I have not thoroughly researched other conditions, and even if I had it would be inappropriate for me to recommend anything to you. I hope that my story and the research I share on the blog can help you, in conjunction with your own doctor and wise healers, make excellent choices for your health care. If you want someone to advise you particularly you can seek out a qualified fertility coach like Sarah Clark. If I do your 79 Things will I get pregnant? I hope so! But the truth is that successful conception and pregnancy is dependent on so many things that you can never know for sure what will work for one person and what will work for some. These things worked for ME (twice!) but YOU may need different things. I hope my overwhelming message to you isn’t to just do THINGS to get pregnant, but to take control of your fertility journey and make a plan to get to your baby. Maybe it will be natural pregnancy, or maybe you will find your baby another way. No one can stop you from being a mother if you are determined to be one- except yourself. Here’s my post on how to be empowered on your baby journey. I’ve recently had a miscarriage or chemical pregnancy. What do you recommend? 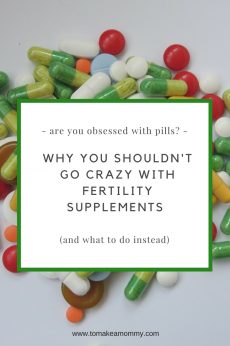 I’ve done the diet and supplements for months and months and I’m not pregnant! What should I do? I hear this so often!! My number one recommendation is DO THE MIND-BODY work!!! So many people just do diet and supplements without doing the mind- body work—- which is totally evidence based also!!! Here’s my overview of what I did, and an example of how I incorporated it into a day. Here’s my guide on the evidence behind it. My number two recommendation is consider taking a break- you can’t be off bananas and other fruits for more than 4 months or so, that’s just crazy. Have a banana, a bunch of sweet potatoes, and a glass of red wine. My third recommendation is- Make a plan. Don’t just keep doing ALL THE THINGS forever. Make a plan with your partner on what the next steps will be on your baby journey, and then stick to it. Here are more of my thoughts on how to do that! And of course, if you have the cash and time consider one of the fertility programs like Sarah Clark of Fab Fertile or Iva Keene of Natural Fertility Prescription who will actually do nutritional and functional testing and determine the best diet for you! I’m overwhelmed and don’t know where to start. What are the MOST important things I need to do? Hey mama-to-be. Take a deep breath. You’ve got this. I get it. 79 Things is too many. I wrote a post just for you- the Top 10 Things I did to get pregnant. Start there honey! I’m totally stressed out by your list of things you did. The more things I do (or even think about doing! ), the more stressed out I get. Well, you’ve got a couple of options. You have four options that I can see- 1) Take a total break from your baby journey, then return ready to commit 100% (this is what worked for me, and as far as I can tell is a good route for Type A/OCD/control issue type people), 2) Decide to do an 80/20 approach. Try to do do most of the things, most of the time, then cut yourself some slack (does not work for me, but works for many women), 3) Seek out a fertility coach like Sarah Clark or Iva Keene who can help guide you through, or 4) Continue to wallow in the abyss of anxiety (I don’t recommend this). And you should DEFINITELY focus on the mind-body work first!!! Yay! I’m pregnant!! 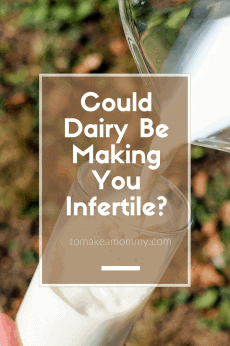 Now, I’m panicking- should I still not eat dairy, gluten, etc.? What can help with my anxiety? Yay! I’m Pregnant! Now What? What are your favorite non-toxic products? I have all my favorite non-toxic products up on this page! What supplements did you and your husband take? The supplements we both took can be found here and my general approach to supplements can be found here! My doctor/acupuncturist/naturopath/psychic/mother-in-law thinks I should do THIS. What do YOU think? I cannot officially advise you on anything in your treatment. And, I don’t have YOUR gut instincts. Here’s a better question- what do YOU think you should do? The most important thing I learned in my journey was to take all advice (yes, even from my doctors) with a grain of salt, and really listen to my own inner intuition on what I should do next. If you are interested in fertility coaching, consider booking a sixty minute fertility consultation session with Sarah Clark, or checking out Iva Keene’s free report on Restoring Fertility Naturally. Here’s my story- I’m lonely and don’t have anyone to talk to about this! Thank you for sharing, and I wish I had time to email/message/chat with all of my readers! While you wait for me to return your email/message (I will eventually! Be patient with me, I love interacting with you! ), please consider joining one of our facebook groups where you can talk with other women taking the long way to baby. These are supportive groups where you can safely tell your story away from the prying eyes of family and friends. Join my newsletter to get the list of everything I did and to get more information on joining the facebook groups!